After one week of keen contest and vigourous voting over the weekend, we have a winner for the caption creative contest! He is none other than the humsup (saltish & watery) cocka! All unclaimed prize will be consumed by the organiser or his goon representative! PS: Sext dime, please offer 20million as first prize; otherwise, DEsi will still miss the sampan. You see, I’m a small man from a small house, nothing more than 200mil will do! 4f: HS, i voted for you but unfortunately my vote is not good enough! i’m here to claim the gift, on behalf of cocka! 4f: didnt know you and kkt yau lou muahahaha…. Sekali bukak mulut, pasti menang punye! 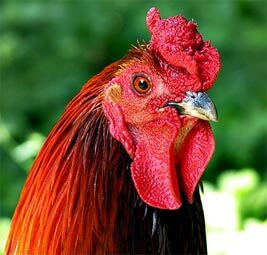 4f: ini ayam bukan sebarangan ayam! congrats, kokokai!! BKT next round on you again, hor? *wink wink*!! 4f: *look left* *look right* where that kkt go hah? when u ask him to buy, buat bodoh aja! 4f: sengkor, not badlah, close fight. u lost by 2 votes only! Hi Seefei – This is my first visit to your blogsite. It’s really neat man. Still can’t get over your “father’s day letter” posted in June 06. It’s a classic. 4f: tenkiu for dropping by and the flattering comment! hang ard and meet the rest of the bloggers here. they are a crazy bunch! congrats to cocka. so, what dessert cocka suka makan? 4f: are you joining us for the dessert? LOL… cocka the winner? Congrat to cocka… anyway, he’ll get? 4f: come to the prize presentation and you will know!! 4f: didnt know unker cocka speaks german! Congrats Cocka and See Fei. You have made blogging world interesting. 4f: SM, glad you enjoy this! wah humpsup cocka win hands on. or claws on! 4f: are you joining us for the prize presentation? Thank you! Thank you all who voted for me!! I’m so touched by this award….I want to thank the Academy for making this possible, my parents who stuck with me thru thick and thin, the organizers for their splendid , but most of all, Emily…..
4f: the winner had spoketh! shall we set a date for the prize presentation. dont worry chilli crab will not be served this time round! Sengjai, you lost by two votes ah? Didn’t you get the titoki sisters to vote for you? 4f: yarloh considering your good relship with the lychee sisters. Congratulations to Cocka. Woo hoo! 4f: tenkiu for taking part SA! not bad, w/o my vote still win…bravo!!! 4f: yarloh! how come you didnt vote hah? hmmm…where did the winner go? if he didn’t come in to collect within 2 hours, can forfeit ah? what’s the prize anyway? 4f: no worry! the fun in participation! Oh man. No one can make a better copywriter than one who is salty wet. 4f: yup, he is the master! yay!! uncle cocka can buy me lunch liao! 4f: dont worry, you will be invited to the prize presentation ceremony!